Although Riot's influence on the metal scene has been wrongfully overlooked over the years, men of certain age and character have a special place in their hearts for the band. The unfortunate passing of founding member Mark Reale no doubt just strengthened that bond. Now the boys are back in town, proudly displaying Riot V shoulder insignia. What initially started out as heavy metal later became more power oriented, and “Unleash the Fire” doesn’t exactly break that mould. The band’s signature sound of an instrumental powerhouse crossing paths with glorious vocal harmonies (courtesy of the excellent Todd Michael Hall) remains largely intact. With good reason; the winning formula produces album highlights like “Take Me Back”, the almost Priest like “Bring the Hammer Down”, the quickfire anthem “Land of the Rising Sun” and even the somewhat expectable Reale tribute, the bluesy ballad “Until We Meet Again”, are all true metal gems. True, orbit shifting moments remain of the radar, but this lot definitely packs excitement born out of inspired musicianship and solid song-writing that lives up to the bands reputation. 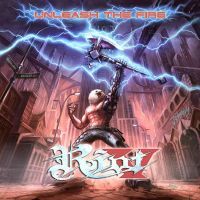 To those wondering what the fuss is all about – give “Unleash the Fire” a try, and the nagging intensity of these songs will no doubt unravel. Cheers!